The Battle of Ontario wrapped up today as the Senators and Marlies met for their 12th and final time this season. 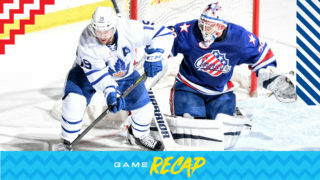 The Marlies came back from behind twice but were unable to finish the job as the Senators edged them 3-2 in overtime. The Marlies saw an early opportunity on the man-advantage as Belleville’s Cody Coloubef was called for cross-checking at 3:55 of the first period. 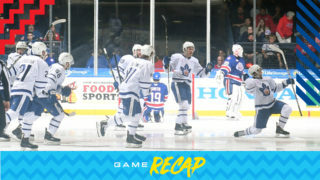 The Marlies were unable to capitalize on the man-advantage and the game returned to even strength. It was back and forth action after that, with each goaltender being tested as both teams looked to draw first blood. The Senators were the first to do so, scoring late in the frame to take a 1-0 lead. Rudolfs Balcers potted the opening goal with 5:07 left to play assisted by Justin Falk and Filip Chlapik. At 16:54, the Marlies saw another chance on the power play as Senators leading scorer, Drake Batherson received a double minor for high-sticking. 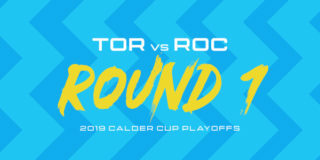 Toronto capitalized on the four-minute penalty at 18:56 as Jeremy Bracco beat Marcus Hogberg with wrist shot from the top of the faceoff circle. Rasmus Sandin and Dmytro Timashov assisted on Bracco’s 22nd of the season. Shots on goal were 11-10 in favour of the Senators through 20 minutes of play. The Marlies went 0/2 on the penalty kill in the second period and had two opportunities on the power play but were unable to capitalize. The Senators held Toronto to only four shots on goal while Kasimir Kaskisuo turned away all 15 shots he faced in the frame to keep the score locked at 1-1. Balcers restored the Senators’ lead at 7:26 of the third period, capitalizing on a power play opportunity. Christian Wolanin and Drake Batherson assisted on the goal. Just past the halfway mark of the frame, Pierre Engvall notched the game tying goal through traffic to make it 2-2. Kristians Rubins and Jordan Subban assisted on Engvall’s 19thof the season. The score remained locked at 2-2 through the remainder of the frame. Chase Balisy scored the game winner just 32 seconds into extra time. The Marlies are back in action tomorrow to close out the regular season at Coca-Cola Coliseum. Puck drops against Cleveland at 4:00 PM. Jeremy Bracco scored at 18:56 of the first period on the power play. Bracco has 14 points (5 goals. 9 assists) in 12 games against Belleville. Bracco has recorded 30 points (8 goals, 22 assists) in his last 24 games. Pierre Engvall scored at 10:48 of the third period. Engvall has 32 points (19 goals, 13 assists) in 70 games. Rasmus Sandin recorded the primary assist on Bracco’s first period power play goal. Sandin has collected 28 points (6 goals, 22 assists) in 44 games this season. Sandin has assists (2) in consecutive games. Dmytro Timashov registered the secondary assist on Bracco’s first period power play goal. Timashov has five points (2 goals, 3 assists) in his last seven games. Kristians Rubins picked up the primary assist on Engvall’s third period goal. Rubins has recorded assists (2) in consecutive games. Jordan Subban had the secondary assist on Rubins’s third period goal. Subban has assists (4) in three consecutive games. Kasimir Kaskisuo stopped 33 of 36 shots he faced. Kaskisuo is now 12-9-4-1 on the season with a .896 Save Percentage and a 3.07 Goals Against Average. Toronto is 24-10-6-2 since January 4 and have outscored their opponents 131-116, facing 17 different teams. In 32 of 42 games, Toronto has earned at least a point (56). Toronto was 2-for-3 for on the penalty kill and was 1-for-5 on the power play. Belleville had a 36-24 edge in shots in all situations. 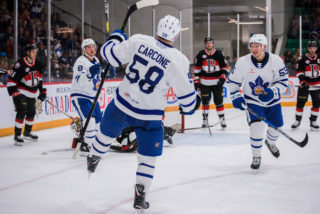 Andreas Borgman and Michael Carcone led the Marlies with four shots on goal. The Marlies are 27-14-9-3 against North Division opponents and end the season 4-4-4-0 against the Senators. The Marlies are 14-7-4-1 when tied after the first period and 7-5-4-2 when tied after the second period. Toronto is 18-13-5-2 when outshot by their opponent. The Marlies are 13-6-1-0 in Saturday games and are 2-1-2-0 in April. Jordan Subban has assists (4) in three consecutive games. I thought that not a lot happening for either team early in the first period. The second period we really didn’t play at all. We were on our heels and they took it to us pretty good. I really liked our third period, we responded well after they scored and then we had a number of opportunities that weren’t really there for us early in the game. Considering what’s at stake for their team in this game and what’s not at stake for us, the fact that we had as good a third period as we did was a very good sign, a big positive for us. Well we never had the puck, so it’s hard to get to the net when we don’t have the puck. They took it to us, they’re a desperate team. Our team is trying to find its way, trying to decide, almost shift to shift at different times, whether we want to win this game, we want to be competitive, we want to give it everything we have, or also we just don’t quite want to get injured in this game, so that’s the balance in the game. I thought they had their moment in the second but as I said, the fact that we dug in and had the push that we did in the third period, you know considering it would be easy for our guys just to mail this one in and get outta here, it was a really good sign. It’s a good sign the fact that we were able to do it against a team like them that’s playing for so much and that’s a very good team as well, so we’ll take that and not focus too much on the second period. 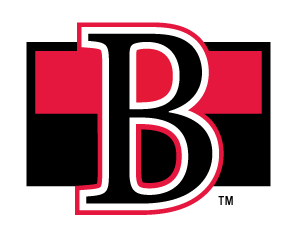 The Battle of Ontario comes to a close today as the Belleville Senators make their final regular season trip to the Coca-Cola Coliseum. 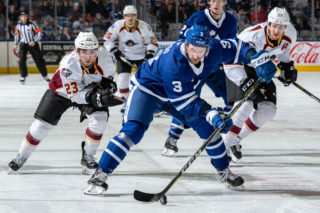 These North Division rivals last met on Wednesday when the Marlies edged the Senators 3-2. The Senators are fighting for their playoff lives and currently sit two points behind the Cleveland Monsters in the North Division standings. They’ll have a tough weekend ahead, taking on the Marlies today and the second place Rochester Americans on Sunday. 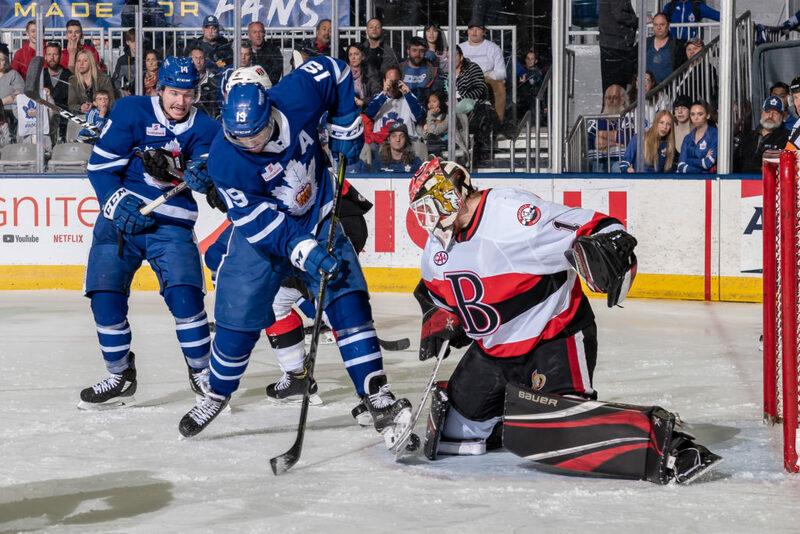 The Marlies have not had an easy road against Belleville this season as the Senators currently hold a 7-4 lead in the season series against Toronto. Five of their 11 meetings have required an overtime or shootout decision, and the Senators have edged the Marlies twice in overtime and once in regulation in their last four meetings. The Marlies have only won one game at home against the Senators this season and with the Senators desperate for a win, it’s bound to be an exciting match-up. 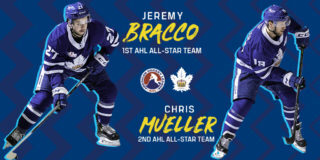 Players to watch: Jeremy Bracco currently leads the AHL in points (21-57-78) and was recently named an AHL First Team All-Star. He is now Toronto’s franchise record holder for points (78), assists (57) and power play assists (31) in a single season. He has 23 multi-point games this season, including two four-point games. Chris Mueller is currently tied for the AHL lead in goals (33), setting a career-high and a franchise record for goals in a single season. He is sixth in the league in points (33-32-65) and was recently named an AHL Second Team All-Star.